I will have loved life. Tu auras gagné après tout. You will have won after all. Il aura fini son projet à temps. He will have finished his project on time. Nous aurons rempli ces documents avant la fermeture. We'll have filled in these documents before closing time. Vous aurez entendu tellement de versions différentes! You will have heard so many different versions! They will have lost in the end. 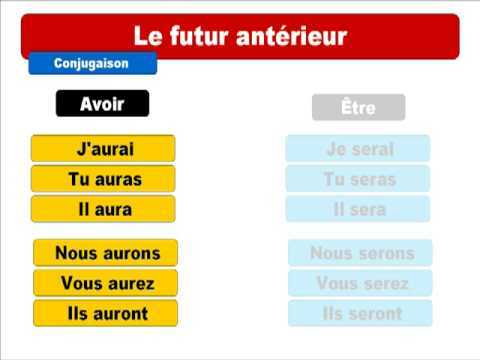 The Futur antérieur is formed on the same model as the Passé Composé, except avoir is here conjugated in the Futur. For -DRE verbs, you form the past participle by replacing the -dre ending with -du. We will have achieved our goal. Il aura attendu pendant des heures. He will have waited for hours. Will you have waited for nothing? Tu n'auras jamais choisi entre nous. You will have never chosen between us. Vous aurez bientôt complété votre collection. You will soon have completed your collection. Vous aurez bien grossi pendant vos vacances! You will have gained quite a bit of weight during your holidays! Nous aurons beaucoup progressé cet été-là. We will have made a lot of progress that summer. Elles auront ralenti trop tard. They will have slowed down too late. Elle aura regretté ça toute sa vie. She will have regretted that all her life. I will have answered too late. I will have grown old after all. Ils auront volé jusqu'au bout. They will have flown until the end. The correct answer was Elles auront bavarde pendant tout le film. Why does bavarder here not agree in gender and number? Or am I missing something? Please help, I have struggled with lesson for awhile now. When the auxiliary verb is avoir, the participle doesn't generally match the subject, only when the auxiliary verb is être. Thank you Chris. Now I need to re-study that! Puis-je utiliser le mot "néanmoins" au lieu de "malgré tout" dans cette phrase? La phrase est <Nous aurons apprécié ce repas malgré tout>. Est-ce qu'il y a quelque chose en particular avec malgré tout que j'aie peut-être raté? Je pense que vous voulez dire "despite everything". I've always been confused by this: "j'aurai du" translates as "I should have" and not as "I will have had to...." but these are not quite the same, I think. "I will have had to catch the 22 bus" suggests that I did catch that particular bus, to achieve whatever, whereas "I should have" suggests that I didn't catch that bus, and perhaps failed in my intention. Similarly for "j'aurai pu" - "I could have" not "I will have been able". I think you are confusing the futur antérieur (future perfect) and the conditionnel antérieur (past conditional). Note: aurais has an 's' here. Note that after words like when, as soon as, once denoting time we use the future in French as opposed to the present in English. Just to add a bit extra to Cécile's great answer, the first person forms of these two tenses sound identical, so you can only tell which is meant from the context. The conditional past introduces modal verbs (would/should) and so does devoir and that can get very complicated and confusing quickly. In most cases, there's another tense and clause involved that gives clear context and often the literal translation isn't even in the same tense as the same idiomatic expression in English. It's incredibly hard to contrive an example with devoir for the future anterieur (in either language) - it's unlikely you'll come across it at all. Hope that helps to clear away some of the confusion! P.S. You can look up how to conjugate avoir to see (and listen to) all six forms of the Conditionnel passé and Futur antérieur. when does the past participle agree in number and gender with the object ?